Previously mentioned, Mikulas, Hungary’s equivalent to Santa Claus, visits on the evening of December 5. 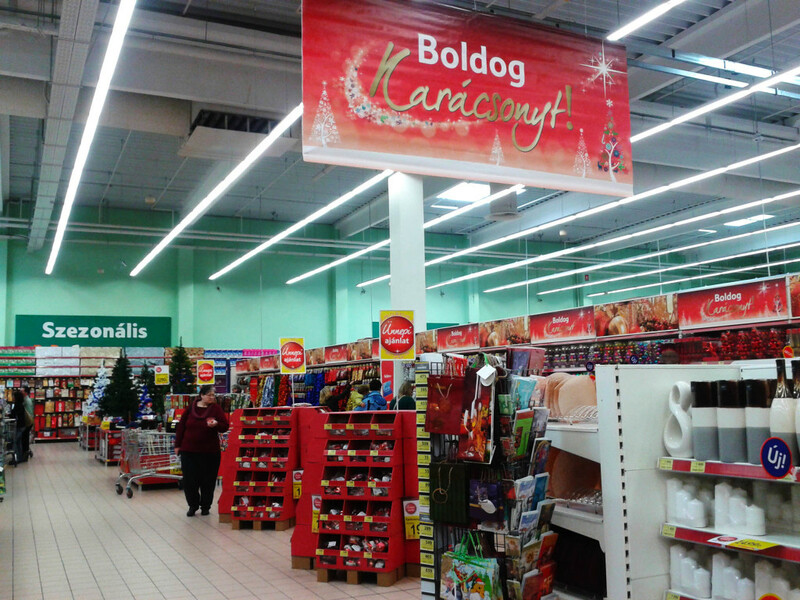 So if he comes earlier in the month, then what do Hungarians do for Christmas? 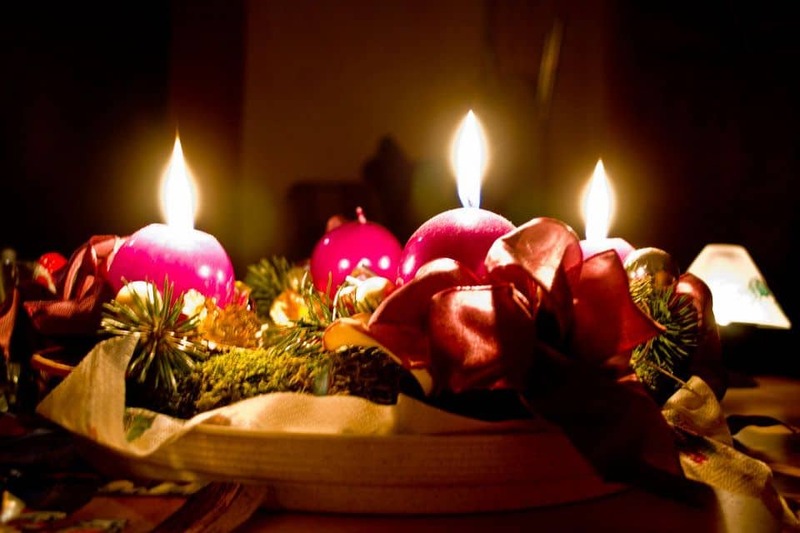 The weeks leading up to Christmas is known as advent and is observed with an advent wreath made up of four candles – three purple ones and one pink. On each of the Sundays leading up to Christmas, one of the candles is lit. A Hungarian friend of mine invited me to light these candles with her. It was the third week of advent. Christmas in Budapest is not the mass consumerism and commercialization that is experienced in most of North America. Instead is remains very much a religious holiday. While I enjoy a little bit of shopping here and there, not having that be the focus of the holidays was a refreshing change while living in Budapest. Okay, so it’s not void of all shopping, but its considerably less. Only one aisle in this Tesco as opposed to a whole section. To celebrate Christmas, typically the family gathers on the 24th to set up and decorate the tree. Some like to decorate by putting szaloncukor on the tree. Throughout the evening and during Christmas dinner, Jesus will bring presents. That night many people will go to midnight mass. December 25th is typically reserved for visiting with family. There is no roasted turkey on the Christmas dinner table like in North America. Instead, you’ll commonly find fish soup served, or sometimes turkey that has been stuffed with chestnut. For dessert, you get beigli, a sweet bread stuffed with poppy seed or walnut and then rolled up. One thing about holidays in Hungary, and probably in most of Europe from what I can see, is that when it’s a holiday, it truly is a holiday. Everything is closed and shut down for days. Forgetting popping into the supermarket to pick up some last minute items for dinner. Nothing will be opened. Having everything closed for the holidays takes some getting used to (especially seeing as many businesses are open in Vancouver on Christmas day), but in many ways it’s nice. You have time to focus on your friends and family. No distractions. How do you celebrate Christmas where you are? Have you experienced any unique traditions while traveling? Yea, it has driven me a little crazy how commercialized everything is now that I’m back home after being away for a couple of years. I really liked that it wasn’t just about what expensive present it is that you’ll get. And I agree! The moment Halloween was over, Christmas trees were coming out and the music started. I love Christmas, but that is just too much. Interesting to read about different Christmas traditions around the world. In Croatia, we have the same cake you have shown here. 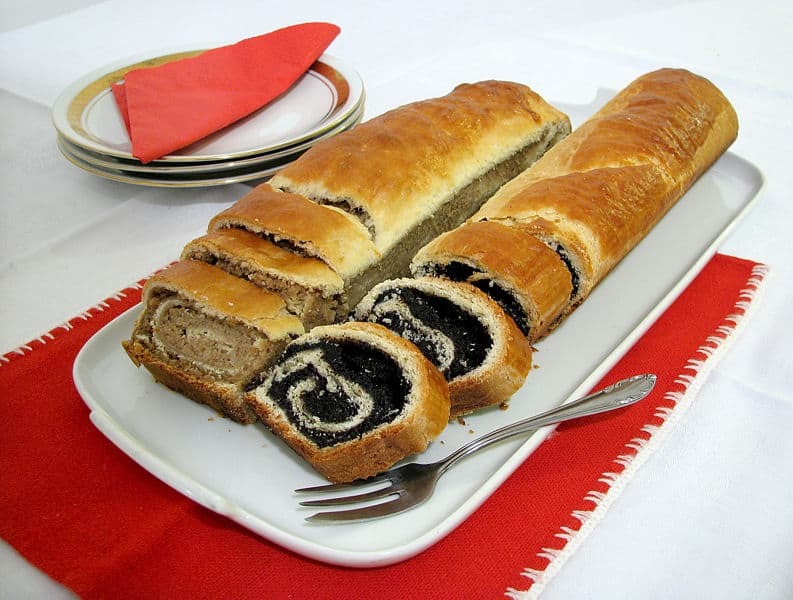 We call it makovnjaca (with poppy seeds) and orahnjaca (walnuts). However, it is not the main Christmas cake. It’s interesting to see that even though Hungary and Croatia are neighbours there are still so many differences. There are other Christmas cakes as well, but I think most people associate the holidays with the beigli. Great photos. The food sounds and looks amazing. I hope you have a great holiday season! Cheers. Thanks Angela! Happy holidays to you too! Thanks Emma! The world is such a diverse place – one holiday and so many different ways of celebrating. It’s pretty cool. Oh, poppy seed beigli! YUM! One of my best friends in the whole wide world is from Budapest, so I’ve been enjoying beigli and her grandma’s homemade palinka for the last 9 odd years (and lentils for New Year’s!). Alas, not getting it this year – there are downsides to long-term travel after all 🙂 I’m a native of Southern Europe, and our Christmas was also a religious holiday first and a shopping spree second (or fifth, or something). I hear it’s all slowly going USA-style nowadays, but I loved when everything was closed for a couple of days. The only distraction we had was food, more food and drinks with varying degrees of alcoholic content. Good times! Lovely post, congrats! Happy holidays! Ah, the wonders of homemade palinka! 🙂 I’m back in North America for Christmas this year and I’m so shocked by the constant messages of sales and buy buy buy. I’m trying to tune it out as much as I can because it’s just too much! I definitely prefer the alternative with lots of food and drinks. Makes for great entertainment. I think I would like separating the ‘Santa’ part of Christmas from the rest of the holiday, since it kind of takes over everything! And I want to try beigli now. It was such a refreshing change. Really nice when the focus was less on the gifts and more on family and togetherness. That food looks amazing! We are so excited to visit Hungary and especially to try all the foods! Love the snow on your page by the way ha, better than the rain here in DC! You’ll have a blast in Hungary! When are you going? I’ll be there for a bit early next year too. I’m enjoying the snow too since all we get in Vancouver is rain like you guys! I don’t actually like it very much (don’t hurt me!). I found it really dry and not much flavor, but it’s been a couple of years since I last had some. Maybe I’ll give it another go next year. We were in Panama last year for Christmas. They have a traditional wreath-shaped egg bread that’s only sold during the holidays, and they take over most of the bread section. The other tradition is to shoot off fireworks on Christmas Eve. New Year’s Eve is even more festive, as Panamanians spend massive amounts of money on Chinese fireworks to celebrate the event. The big ones that shoot hundreds of feet into the sky. The eager locals begin as soon as the sun starts to set and shoot them off all over the city until the wee hours of the morning. Last year we celebrated atop our high-rise and watched the entire city sparkle and pop. Thanks for the invite! I’ve been offline for the past couple days and seem to have missed the deadline. Hope you guys get lots of photos! Thanks a lot for getting back to us! We are planning to post it tomorrow, so if you want, you still have a little time to send us something 🙂 Thanks for connecting with us on Twitter! Happy New year, Adelina! It is so nice to read about the Christmas traditions of my country in your blog:) The poppy-seed cake is my favorite cake! I have lived in Spain for many years now, your post made me feel nostalgic!